Learn how to grow chilli plants from seeds from the experts. We were featured on the BBC Gardeners World programme during their 2006 chilli seed trial. To purchase chilli seeds go to the chilli seeds page. Click on the following links to view our advice leaflets: "Growing Chillies from Seed and Plant Care" "Unpacking Your Chilli Seedling Plug Plants" "8-plug Growing Kit Instructions"
How-To videos on germination, watering, feeding and more can be found here and our FAQ sheet can be downloaded here. In the UK, chilli seeds need to be sown early in the year and grown on in a greenhouse or poly-tunnel, although they can be grown outside in a sunny spot during the height of summer. Germination can be very variable between varieties and can take as much as five weeks, though the varieties we sell on our seed page should all germinate within 10-14 days, some sooner. To help you get going, we have listed some of the tricks and guidelines we use to give our chillies the best start possible and for growing-on in pots. We recommend that you use soil-based seed and potting-on composts - chillies really appreciate good drainage. We recommend a 'John Innes loam based seed compost' for germination. Germination speed and percentage is greatly improved by applying warmth to the seed compost. We use thermostatically-controlled heated propagators, but placing the seed pots/trays in a warm environment or on a simple heated tray will also work well. With the seed compost at 27-32°C (80-90°F), you should see good results. Seeds will still germinate down to 21°C (70°F) but germination will be slower and more erratic. If the temperature drifts towards 38°C (100°F) germination will be quick but there will be a lower success rate. Try to use surface watering with a spray bottle rather than watering from the base, surface watering has less effect on the temperature of the compost. Don't over water, and certainly don't make them swim. Watering with a sprayer causes less impact. We mainly sow seeds during February and March, but you can leave it later. There is a great variance in the number of days taken for a particular variety to reach maturity. Some can produce ripe fruit in 60 days from sowing and others take as long as 120 days. Remember that varieties such as Habaneros take 100 or more days (3 1/2 months) from potting on to reach maturity. So these need to be started in good time or the fruit will never ripen. We tend to sow seeds about 5mm deep and in small pots, with a number of seeds of the same variety in each pot. Keeping each variety in its own pot is a good idea because germination time varies greatly. As soon as the majority of the seeds in a pot have emerged and are showing two well formed leaves, and certainly before they become leggy, they should be transferred into 3 inch pots. Hold the seedlings by the leaves, and not the stems. Note that some seedlings may need a little gentle help getting free of the seed pod. If you have the propagator space you can sow directly into 3 inch pots. At this stage they should be moved to a site where they will get plenty of sunlight; ideally to a heated greenhouse or warm conservatory. Continue to keep them warm, moist and well ventilated. They can stay in a 3 inch pot until they are 3 to 6 inches high. When the plants have about 5 pairs of leaves they should be potted-on into larger pots. We grow most of our plants in the ground and this is a possibility if you have a polytunnel or open soil in your greenhouse. Otherwise pot-on into 9 to 12 inch pots depending on the variety. You can use smaller pots for compact ornamental varieties. As the summer sun intensifies, you may need to provide some shade, for example, lining your greenhouse or painting with greenhouse paint. Try to keep the plants below 36°C, be careful not to feed them a lot of nitrogen (they will grow big, but can forget to set fruit) and don't let them dry out; that should help prevent blossom-drop and pod-drop. Larger varieties may need support with a cane. Ornamental varieties can be moved to a bright position in the house or to a patio once they are well established. If your flowers are dropping off there could be a number of causes. If they are outside it is probably cold windy weather. If they are indoors it could be lack of humidity, in which case give them a mist spray. Lack of feed may also reduce flower production. Different varieties are picked at different stages of their development. Fruits that start yellow or green generally ripen to red, though green chillies will sometimes ripen to orange or yellow, it all depends on the variety. Usually, and regardless of the colour, once they have filled out and become firm crisp and glossy they can be picked. Experiment by picking one to see if it has all it's heat and flavour. The sooner you pick the more the plant will produce so even if you don't need them at the time you should pick them and keep them in the freezer until you do. Most chilli plants can be treated as perennial house plants, but will need some pruning in the winter. Some varieties are better suited than others, smaller hot varieties like Serrano and Twilight, and Prairie Fire do better than the bigger fleshy plants such as Poblano and Anaheim. Q: What variety of chilli plant should I grow? A: We are often asked this, and we start by asking how you will use the chillies. Pot plant chillies for a windowsill? We have plenty to choose from in this category, some of the best being Thai Hot, Pretty Purple and Apache. Medium-Hot for Salsa, pickling, mild sauces and stuffing? Some great varieties in this category are – Santa Fe Grande, Jalapeno and Cherry Bomb. Mild chillies for stuffing? Poblano and Anaheim are great for Mexican stuffed chilli recipes. Hot and Very hot chillies for cooking? Any of the Habaneros, Ring of Fire and Aji Limon are all great for cooking hot dishes – for extremely hot – the Bhut Jolokia. Plants for the patio? We recommend a plant with smaller fruits or pliable stems to prevent too much damage from rough weather. Twilight, Aji Limon and Firecracker are good choices. You can grow other varieties, but they may need some support from canes. What chilli plants are best for hanging baskets? At the farm, we plant hanging baskets for Summer display with the following varieties: Super, Apache, Thai Hot, Firecracker, Pretty Purple and Purple Tiger. Q: What is the best time of year to start sowing in the UK? A: March usually works out best for sowing chilli seeds. You can sow earlier, but you may need a heated propagator. Q: How late in the Spring can I sow chilli seeds? A: This depends on the variety, and at what stage you will pick the fruits. For smaller, quick growing plants and for varieties that are used 'green', sowing can be done as late as June in the UK. The hotter varieties which are mostly used when ripe, tend to need a longer growing time and are best sown earlier. If you do miss the main sowing time, all chillies are perennial, so, if kept frost-free over winter, they will get you off to a quick start in the following season. 1- There is less need for a heated propagator. 2- The seedlings and plants will come on quickly due to the warmer conditions and longer day length. The advantage of sowing early in the year is that you can maximize the crop from multiple harvests. Q: I have followed your tips, but my seeds have not germinated. What went wrong? A: The links above to the tips on growing from seed may help. Chilli seeds need a steady temperature of 25c to 28c to germinate and they also need a good quality seed compost - fine material, good drainage and not too high in nitrogen. The seeds should also be kept moist (if they are allowed to dry out, germination can be erratic), but not too wet (which can cause imbibition issues). If the growing conditions are not ideal, they may take a long time to germinate – they can still germinate up to a month after sowing. At the farm, we sow into Vermiculite with the seeds about 3mm-5mm below the surface. We water well from the base until the moisture appears on the surface, then move the seed pot/tray to a heated propagator. From sowing, we surface water with a dilute solution of Chilli Focus in a fine spray (https://www.southdevonchillifarm.co.uk/online-shop/chilli-growing-equipment/chill-focus-plant-food/). In these conditions, we expect most of the seed to germinate within two weeks, but a few varieties take longer. 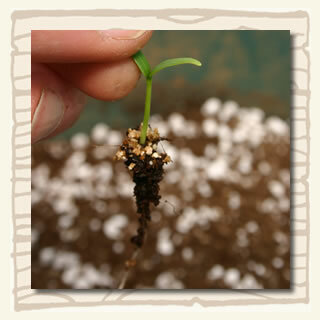 Q: I have used ‘plugs’ and I have sown two seeds in each. What should I do if both germinate? 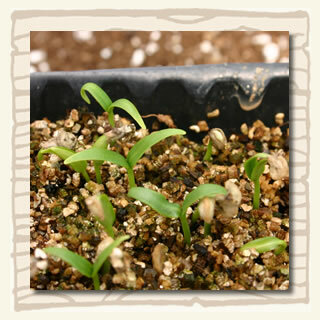 A: The best plan is to let them un-curl their false leaves, then pinch out (above the surface) the weaker one. Q: My seedlings are collapsing after germination and dying. What am I doing wrong? To avoid the problem spreading to healthy seedlings, remove any affected plants. Q: I have germinated in a warm cupboard and the seedlings are now very leggy; what should I do? A: A warm cupboard is a great place to encourage germination, but it is best to check them every day to see if they have sprouted (showing on the surface). As soon as they start to emerge, it is best to move them to good sun light so that they can start generating food. If they do get leggy, prick them out into individual pots and set them so that there is about 1cm gap from the compost to the first leaves – this will make them more stable and less likely to be damaged by watering. Q: My chilli seedlings are leggy; what should I do? Q: When using your plugs, how should I sow them and pot them on? A: At the farm, when we sow chilli seeds into plugs, we usually sow two seeds per plug and pick-out the weaker seedlings to leave just one per plug. Once the seedling in the plug has three or four true sets of leaves, we pot-on into a 1ltr (about 6”) pot. Q: What pot sizes should I use for chilli plants? A: We recommend using a 3” (7.5cm) pot for the first transplant, and then using progressively larger pots as the chilli plant develops. Our experience is that the plants do better with a fairly gradual size increase, rather than potting on into a pot that is much larger than the plant needs, for example: 3”, 6”, 9”, and 12”. The final pot size will depend on the growing conditions, the variety of chilli and where the plant is being grown. Q: What compost should I use? A: There are several brands available in garden centres for a compost made to the John Innes #2 formula. This is a soil-based compost with good drainage, suitable pH and a good level of nutrients. Soil-based composts are also easy to re-wet when dry, and are still heavy when dry (which avoids problems with pots blowing over or being knocked over). Q: What should I feed my chilli plants and how often? A: We recommend Chilli Focus, available from our web page in three sizes. A weak solution should be used initially (see bottle for guidelines), building up as the plant matures. A weekly feed is usually sufficient, depending on the richness of the compost, and how often you re-pot. Q: What type of plant food do chilli plants like? A: The best approach is to use a reasonably balanced feed, but one that has a good quantity of potash (potassium) to encourage flowering and fruiting. We sell a feed called Chilli Focus which is formulated for chilli plants. Q: Can I use an automatic watering system? A: Yes, you can. We recommend that the compost should contain a significant amount of drainage matter, such as perlite to help keep air around the roots. You can make a simple auto-watering system by placing pots on a platform over a water tray. Feed a thin strip of capillary matting into the pot from the base and trail into the water tray. Q: How often should I water my plants? A: Chilli plants enjoy a good watering followed by a period without water – until the compost is almost dry. Select a compost with good drainage to help keep air in the soil and try to avoid the pot standing in water. If the underside of leaves develop oedema (white ‘fluff’ or crystals), that is a sign that the plant has too much water at the roots. Q: Should I water from the top or the base? A: If you can, water from the base. This will reduce the likelihood of algae developing on the compost surface, which can reduce the air and nutrients from liquid feeding that are available to the plant. Avoid the plant sitting in water for long periods of time as this will damage the lower roots. Q: Can I grow chilli plants in a pot outside on a patio? Go big on the drainage in the compost/raised bed to prevent the roots being waterlogged. Use black pots – they help to keep the compost warm. Use rain guards around the plant base to deflect heavy rain. Consider bringing the pots indoors during bad weather. Use soil-based compost (heavy, so less likely to blow over) John Innes No.2 is a good choice. Select small/light fruited varieties (less likely to get damaged in bad weather). Pick the fruits green to maximise the crop – expect a lower yield compared to greenhouse growing. Support the plant with canes and place in a warm, sheltered spot. Q: Do chillies grow well under artificial lights? A: Although we don’t currently use artificial light at the farm, we have heard from customers that chillies grow very well to these growing systems. As they are light-hungry plants, stronger lighting systems would work best. Q: Can I grow chillies hydroponically? A: Yes, we have experimented with this at the farm using aerated ‘water-bath’ feeding/growing systems, and it works very well. Plants can also be grown in inert material with drip-fed water and nutrients. All the chillies grown by South Devon Chilli Farm are grown in the soil and in poytunnels. If you don’t have access to a garden, hydroponics is an alternative when you are looking to grow a good crop of chillies, particularly when growing some of the larger varieties. Q: Does it help to hand-pollinate chilli flowers? A: Chillies have ‘perfect flowers’ meaning they don’t need help from another plant or pollinating insects to set fruits. In our crop tunnels, we don’t hand pollinate, but there is some pollination care of bees and hoverflies in the polytunnels. The vast majority of our crop will be from self-pollinated flowers. Chilli plants usually produce an abundance of flowers – more than they need or could sustain if they all turned to fruits. There is some evidence that fruits produced from cross pollination tend to be larger and contain more seeds, so it would be worth trying some hand pollination for the fruits that you want to be bigger. To hand pollinate, use a fine art brush. Q: I am having problems with fruit yield; how do I improve the cropping? Too little potash can cause set flowers to abort (try our Chilli Focus feed). Q: My chillies fruits have black marks on, is that a problem? A: As long as the fruits are firm, the black is just an early sign of ripening. There are a few chillies that we get asked about concerning blackening – Jalapeno very often has black streaks before ripening. We sometime get the same question concerning the plants which can develop black marks around the divisions in the stems, which is very common and not a problem. Q: How long before I can pick fruit? A: From sowing, chilli plants vary from about 80 to 120 days to fruit being ready. If you are using the unripe (green) fruit, this range will be reduced. Our seed packets have information on typical fruiting times. This information is repeated on our web page in the seed section. Q: When should I pick the fruit on my plant? A: To keep a plant busy, pick the fruits as soon as they are the size and colour you want. We pick a lot of fully-grown green chillies such as Ring of Fire, Jalapeno, Poblano and Hungarian Hot Wax. These varieties are traditionally used green/unripe. Once the fruits are picked, the plant will form new flowers and mature smaller fruits. If you are looking to cook with fresh or dried brightly coloured chillies, pick the fruits as soon as they reach the ripe colour to maximise crop weight. Q: Are any chillies ripe when green? A: No, they all turn to one of the following colours as they ripen: Red, Orange, Yellow, Brown or white. Some varieties go through a several colours as they ripen, and some develop ‘black’ marks prior to ripening. Ripening tends to accelerate towards the end of the growing season. Q: How do I control Spider Mites on my chilli plants? A: Spider mites can be a problem during periods of hot, dry weather. These conditions will greatly increase the lifecycle of Spider Mites, allowing them to get to such large numbers that they can harm the plant. The signs are very fine web on the under-side of the leaves, and ‘windows’ that can be seen from the top of the leaves. You can also consider cutting off heavily infested section of the plant to stop the spread. Q: How do I control aphids on my chilli plants? White ‘flies’ on the top of the leave are probably shed skins of aphids, and will wash off with a hand-sprayer. Q: My plant has yellow leaves. What’s wrong with it? - Poor drainage. If the plant is in very wet soil, it will not be able to take up nutrients from the soil. Re-pot into good quality, free-draining compost and allow to dry out. Avoid leaving the plant sitting in water. - Poor soil or feed. Compost or feed low in essential nutrients (in particular, Nitrogen) can cause leaves to look pale. Re-pot into good quality compost or try a new feed. - Pest attack. Inspect the plant carefully for pests – especially on the underside of leaves. Use the recommended treatment (see above) and feed the plant to help it recover. - Viruses and bacteria. Plants that have been attacked by a pest can sometime succumb to a virus. If the pests are removed and the affected leaves removed, the plant can sometimes be saved. Q: Do I need to prune my chilli plants to get a good crop? A: We don't prune our crop plants at the farm. We do sometimes pick off set fruit on small Hungarian Wax plants as they can sometimes get a little preoccupied with developing the first fruit that sets, but this doesn't happen very often. Pruning to re-shape a plant may be needed if it has grown a little too much towards a bright window, or to remove dead growth while over wintering a plant. As long as you provide good spacing and good light, chilli plants usually develop into a natural bush shape. Q: Can I train my chilli plants like tomatoes? A: If you wanted to train the plants into a more vertical shape, then pruning out the side shoots would be necessary. This is a technique used by large greenhouse pepper growers to maximize the area under glass. 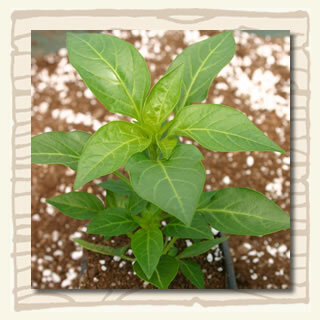 Q: I would like to keep my chilli plant over winter, what should I do? A: Chilli plants tend to stop growing and flowering during the winter months in the UK. If the plant is coming in from a greenhouse or patio, you may need to prune it to fit the available space. You can lightly prune to re-shape the plant or heavily prune to just leave the main stem. If the plant grew to an ideal size, then a hard pruning will allow it to re-grow with the same fruit cover and size the following season. Keep the compost just off dry while the plant is dormant and keep it somewhere light, but not with extremes of temperature. In the UK, overwintered plants usually start to become active in March or April, depending on where they are being kept. Fresh compost in the Spring will help to get them going. Q: How do I dry the chillies I have grown? A: Drying chillies is more about air circulation than heat, so place them in a well-aired basket and put them somewhere warm – such as over a radiator. Spread the chillies in a thin layer and leave the stalk attached. They should dry out in a few days. Chillies with thick flesh (like Jalapenos) are not a good choice for drying. A thin-fleshed chilli, like Ring-of-Fire, is an easy chilli to dry. Once dry, store in an airtight glass jar or tin, and keep out of direct sunlight to preserve the colour and flavour. Q: Can I freeze chillies? A: Yes, they freeze very well. They don’t lose any heat and are easier to chop finely when frozen. To save space in your freezer, chop chillies (by hand or in a food processor) before freezing and store in thin slabs or ice-cube trays. Q: How do I pickle chillies? Q: I would like to collect and save chilli seed for next season, do you have any tips? A: The ideal time to pick a chilli to be used for seed stock is just as it reaches its ripe colour. Cut the fruit open and with a blunt instrument, scrape the seeds out onto paper. Place the seeds in a warm spot out of direct sunlight until they dry a little – this will prevent them developing mould. Store wrapped in foil and place the foil wrapper in a tin or glass jar with a lid. Store the jar/tin in a cool place (in a cupboard). The fridge is good if you want to keep the seed for several years, but they should be fine for a couple of years if they are dried a little before storing. To receive occasional updates on growing chillies, subscribe to our newsletter.